*The box below is a new feature aimed at making these articles even more engaging; now, if readers don’t have time to read the full piece, they can just scan the box in an instant and get started! Key: We are in control of our own enjoyable life. 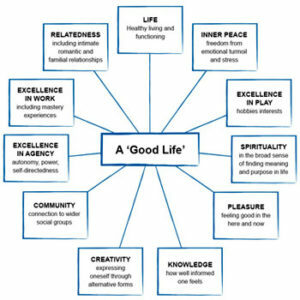 Living it: Build an enjoyable life by making smart choices focused on present and future joy. Clinical Concept: Applying nurturing self-discipline in a positive psychology mindset. What would you say if you only had one message for the world, or your child, about how to live the best life? I asked myself this question because it is essentially a means to self-discover what you were put here on this rock to do with yourself. I pondered it for quite a while and then I smacked my head. Sometimes I think too hard about the simple stuff. I realized that it’s the same message and mindset which I had already shared with clients, colleagues, friends, family, teachers—basically everyone—for over 20 years. 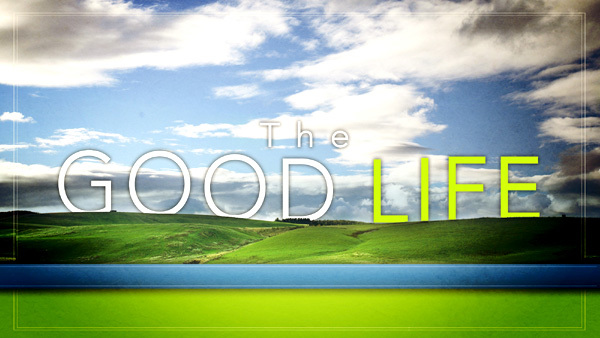 You want a good life? 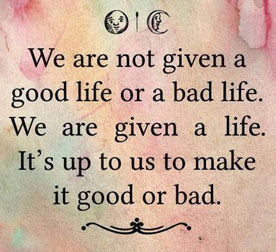 A great life? An enjoyable life? T hen life must be enjoyable. If we want a kid to stop using drugs, using violence or using other distractions to get through their day then we need to help them build an enjoyable life. The same is true for their parents and all adults and, I dare say, the whole world. Life must be enjoyable. At first glance it seems both obvious and bold, which is a good sign to me that it’s powerful. The data also backs that up. A 2012 review of “more than 200 studies found a connection between positive psychological attributes, such as happiness, optimism and life satisfaction and a lowered risk of cardiovascular disease” while a study in the Canadian Medical Association Journal found a correlation between 60 and older people who expressed less life enjoyment and developed more disability over an eight year period which doesn’t say life enjoyment prevents disability but it “suggests a relationship” according to Elizabeth Landau, former science writer/producer at CNN and present Senior Storyteller at NASA (2014). 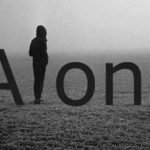 Feel free to search the site and you will find many other articles on the many emotional, mental and physical benefits of an enjoyable life. The best part? 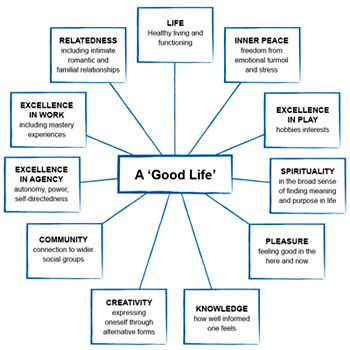 “The good life is possible; it’s within our grasp, and it is not measured only by the number of years we live,” declared David J. Pollay, co-founder of the International Positive Psychology Association (IPPA). Not only in our grasp, but under our direct control by as much as 50% according to 2007 research and my guess is it’s even greater today with the increase in nontraditional work environments, mindfulness and a growing availability of positive life choices (Pollay, 2007). Just “enjoying life” is more of a devil-may-care, pleasure-driven slogan, which this isn’t. “Be happy” is another honestly, weak term because happiness is not a constant. Happiness, by nature, depends on what happens—that’s why I say that our control of our good life is over 50%, because our response to what happens is also under our control. Joy is different. Joy is a positive feeling that comes from within us, not caused by what happens outside us, so it is a constant. Joy is powerful if we cultivate it. The prefix “en” can be defined as “to put into” thus for life to be enjoyable, it has to be a cycle of effort. We put our joy in and life returns joy—if we have designed our life as enjoyable. “Able” is the most important action in the sentence as it is where our control and our choices are found. The “must” is our commitment to making our life enjoyable. The “must” is our external focus. Maybe we don’t take on that extra project at work or school because our life must be enjoyable, and that’s too much. Maybe we do take it on because life must be enjoyable and the benefits of going through that stress as well as the outcome is a net positive enjoyment. 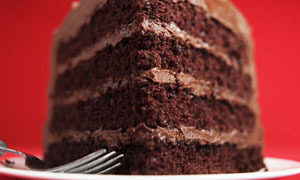 Maybe we don’t take that extra piece of triple chocolate cake because life must be enjoyable and right now we’re making other eating choices for short and long term joy. Maybe we don’t drink for the same reasons. Or, maybe we drink and eat cake because it does fit into our enjoyable life because the benefits outweigh the challenges. It is up to us to make our life enjoyable and it means the exact opposite of just having fun all the time; it means purposeful self-control with a focus on present and future joy. What?! Self-control is not fun! Oh, yeah? That’s not what the University of Chicago found. “The more self-control people reported having, the more satisfied they reported being with their lives. And contrary to what the researchers were expecting, people with more self-control were also more likely to be happy in the short-term. In fact, when they further analyzed the data, they found that such people’s increased happiness to a large extent accounted for the increased life satisfaction. As they go about their daily lives, people with a lot of self-control appear to generally be in higher spirits; in the long run, they’re happier with their lives.” (Abrams, 2013). So how do these people higher in self-control do it? Are they just born this way and the rest of us are doomed? Nope. It all goes back to using their “must” and their “able” in a way that prioritizes their present and long term joy. “What they figured out” Abrams wrote, “is that instead of constantly denying themselves, people high in self-control are simply less likely to find themselves in situations where that’s even an issue. They don’t waste time fighting inner battles over whether or not to eat a second piece of cake. They’re above such petty temptations” (2013). What I love best about this finding is that the battle isn’t over eating a piece of cake, it’s over eating a second piece of cake! A first piece of cake sounds like an enjoyable life, or a life where we’re nurturing ourselves in change, not coming down on ourselves. A second piece is where the commitment to and control of our enjoyable life are called to perform. Success in these challenging moments is not as much a product of willpower, but of positive perspective. “People who have an optimistic mindset…engage in healthy behaviors because they perceive them as helpful in achieving their goals.” Tons of data has proven that willpower weakens with use and positive perspective strengthens. Positive people “savor the present, are grateful for the past, and are hopeful for the future…” because they believe life must be enjoyable and are striving to make choices through the lens of present and future joy (Pollay, 2007). That doesn’t mean perfection, it actually means learning from mistakes, since the first step is looking at our present life’s enjoyability level and pondering where to make changes. This is best done with a sense of self-nurturing wonder and excitement and no recrimination. It’s important to cultivate that attitude at the outset since we’ll need it as we build our enjoyable life. Nurturing ourselves is just like nurturing any other creature, we’re gentle, forgiving, setting healthy boundaries but also making sure there’s room for fun. I’m sure we’ll talk about that more another time. For now, that enjoyable life is as easy as one first positive choice; the “must.” Let’s take a stand for our own enjoyability today and the next will be simpler, and the next. Some choices may not be easy but as long as we prioritize our present and future joy, the benefits will come with the first choice.